It was one of the most infamous plays in all of Blue Jays history. It happened during Game Three of the 1992 World Series. The fourth inning. A man on first and second and nobody out. Halle Berry's fiancee — Atlanta outfielder David Justice — comes to the plate. He hits a long, deep fly ball to centrefield. Blue Jays centrefielder Devon White races back to make a spectacular catch as he crashes up against the wall. That's the first out. 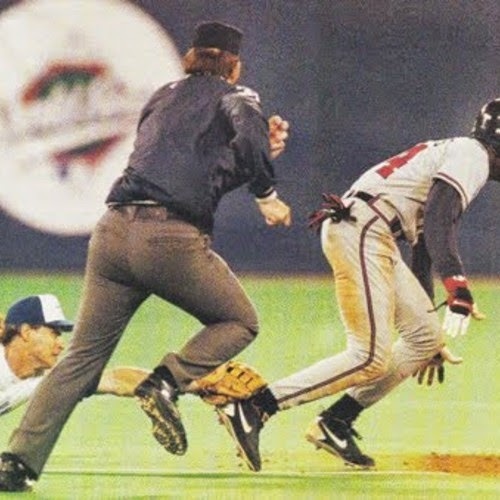 Then, the runners get confused — Terry Pendleton accidentally runs past his teammate, "Neon" Deion Sanders, which means that Pendleton is out too. That's two down. Now the ball is thrown back to the infield and comes to the Blue Jays' gloriously mulleted third baseman, Kelly Gruber. He chases Sanders — a man so fast he also returns punts in the NFL — back toward second. Gruber dives, his glove outstretched, and tags Sanders on the back of the foot. Sanders is out. It's a triple play. It's only the second time that's ever happened in a World Series. It's history. But the umpire fucks it up. He calls Sanders safe. And more than 20 years later, Blue Jays fans still can't believe it. So what better possible inspiration could you find for a three-song EP of electronic music? None. And that's exactly where DJ Flex Rock has found the theme for the three songs on his latest release. Each of the tracks is named after one of the Atlanta players who made an out on that play all the way back in the days when the first George Bush was still President and Boyz II Men were at the top of the charts.